Tuesday night at 3rd and Lindsley, reigning Country Music Association and Academy of Country Music Female Vocalist of the Year Miranda Lambert headlined an acoustic show with proceeds being used to establish the Miranda Lambert Women Creators Fund at Belmont University’s Mike Curb College of Entertainment and Music Business. The purpose of the fund is to provide a scholarship to outstanding women students. As part of Miranda’s ongoing pledge to support other female artists, Lambert invited her writer pals Natalie Hemby and Jessi Alexander to participate in this special evening celebrating women for her unplugged version of the “Roadside Bars and Pink Guitars” Tour. 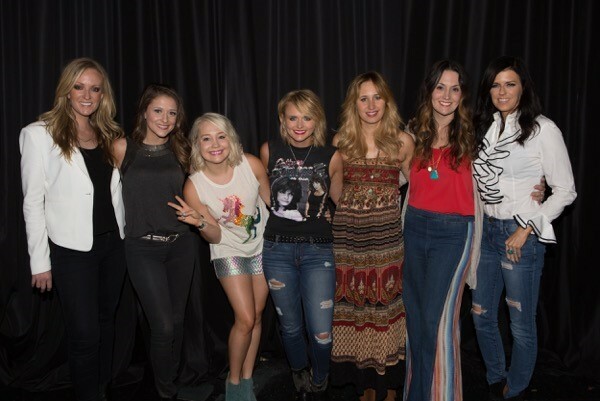 She was joined by her fall tourmates Raelynn, Clare Dunn and Courtney Cole. Hemby, Dunn and Cole are all Belmont University graduates. The Miranda Lambert Women Creators Fund will provide over $40,000 in scholarship funds to a female student majoring in music business, songwriting or entertainment industry studies enrolled for the 2016/2017 academic year. In 1971, Belmont first established a Music Business program designed to prepare young women and men for operational, administrative, creative and technical careers in the music industry. The program grew in both size and reputation, leading to the advent of the full Mike Curb College of Entertainment and Music Business in 2003. Currently home to more than 2,000 undergraduates with majors in five areas—music business, audio engineering technology, entertainment industry studies, songwriting and motion pictures—the college boasts an impressive faculty of academic scholars and authors, entrepreneurs, songwriters, producers, filmmakers and sound and recording engineers. It is a world leader in music business and entertainment industry education and the only freestanding college of its kind. Grammy Award winning singer-songwriter Miranda Lambert is the reigning five-time CMA and reigning six-time ACM Female Vocalist of the Year. The first single off of Lambert’s fifth studio album, Platinum, “Automatic,” was Lambert’s highest charting first week single to date and won CMA Song of the Year. Her duet with Carrie Underwood, the album’s second single, “Somethin’ Bad,” has been certified as an RIAA Platinum Digital Single. Platinum, made history when it debuted atop Billboard’s Top Country Albums Chart, making Lambert the first country artist in the history of the chart to have each of her five albums debut at number one. Platinum also debuted at the top of the all genre Billboard 200 as the number one album in the nation. In addition to her award winning music, she dedicates much of her time to her MuttNation Foundation. She owns two lifestyle boutiques, general stores she named, The Pink Pistol, that are located in her hometown of Lindale, Texas, and Tishomingo, Oklahoma. She also added The Ladysmith, a bed & breakfast in Tishomingo, to her empire this past year. In addition, Lambert has designed a shoe line that is available at DSW, Off Broadway, Shoe Dept, Shoe Carnival, Country Outfitters and other retailers across the country.